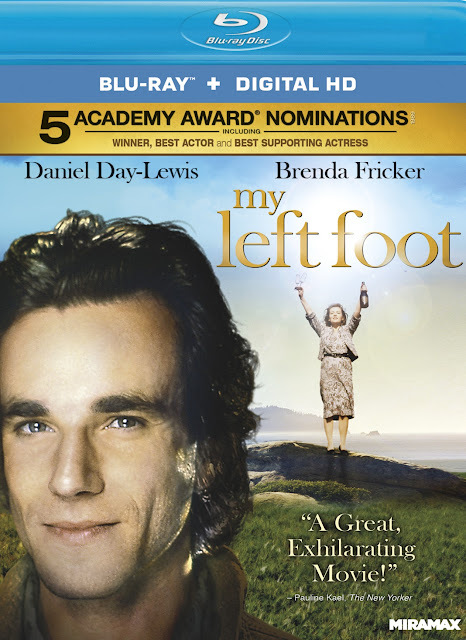 I had no expectations from the 1989 movie My Left Foot and picked it up because it was set in Ireland. Yes, it was to be another movie in our armchair traveller's trip to Ireland. Anyway, I thought that the movie started off slowly and that it seemed dated but in the end the story of Christy Brown and his family reeled both myself and my husband in. 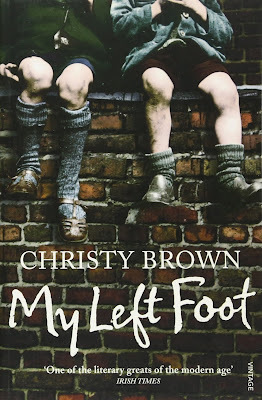 Christy Brown was born with cerebral palsy in 1930s Dublin in a time when most born with that disease and many others were shipped off to care facilities. However, Christy was born into a poor family who could not afford to send him away and was raised in the interesting and economically struggling environment that he was born into. Despite the many challenges provided by this home, he was loved and was included and eventually goes on to become a painter and the author of numerous books including the one of his own story as shown below. Is My Left Foot recommended by me? YES. We totally enjoyed this story despite the uncertain beginning. But don't take my word for it, this movie was unexpectedly successful and widely circulated in the end but originally produced for the local Irish market. When it received wider circulation both the critics and the audiences liked it. Daniel Day-Lewis won an Academy Award for Best Actor and Brenda Fricker for Best Supporting Actress. Other nominations for the film were for Best Adapted Screenplay, Best Director and for Best Picture. I believe that the cast, which also included Ray McAnally and Fiona Shaw, was indeed excellent and that the movie drew us in in large part because of the performances put in by that cast. Roger Ebert said, "It is the story of a stubborn, difficult, blessed and gifted man who was dealt a bad hand, who played it brilliantly, and who left us some good books, some good paintings and the example of his courage." The Guardian calls it, "A moving portrayal of an astonishing man with a brilliant brain trapped inside a damaged body." If you like a good story about one person's battle to express himself and you don't mind that it is a bit gritty and dated, I think you might enjoy My Left Foot. While it is not meant to be about Ireland, it is a good peek into Dublin in the 1930s. Let me know what you think of it if you do check the movie out. Find the Christy Brown book and movie on Amazon. Fifty Dead Men Walking movie review.